India Beats China for "Chinese" Seat on JIU, Where Tarasov Goes from Kuwait? UNITED NATIONS, November 22, updated -- As the two most populous countries on Earth, except along their border it's rare for India and China to face off. 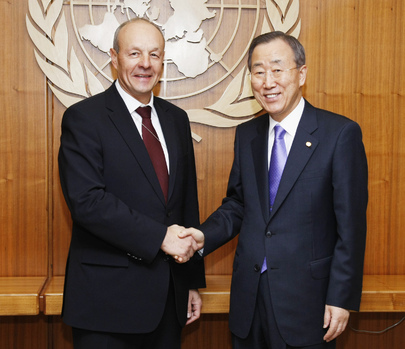 But it happened Tuesday at the UN for a seat on the Geneva-based Joint Inspection Unit. That there was even a competition was surprising. Of the JIU's 11 inspectors, retiring American Deborah Wynes was replaced without any opposition, on a so-called clean slate, by another American, George Bartisiotas. Update of Nov 23: a senior Russian source says that the JIU term, contrary to the information sheet put out by the UN, begins in 2013, so "Tarasov has a full year" to continue on Kuwait. Duly noted. But which China's ZHANG Yishang retired, not only Chinese ZHANG Yan (his country's ambassador to Delhi) ran -- India's A. Gopinathan also entered the race. And by a vote of 106 to 77, Gopinathan won. Adding insult to injury, Indian media reported that "China's Zhang Yishan was already a member of the JIU and was seeking renewal of his term." But Yishan is retiring - it's Yan who ran and lost: to now remain in Delhi? India says it didn't know that China was putting forward a candidate for the seat Yishan had occupied, saying "there are no Permanent seats" on the JIU. But with Russia and the US replacing their own candidates unopposed, it sure looks like there are. Watch this site.